Would you rather skip the crowded restaurants this year? 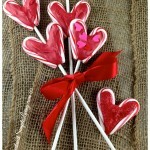 Want to include the whole family in your Valentine’s celebration? Maybe even the neighbors? We’ve got plenty of Valentine’s Day ideas for you. 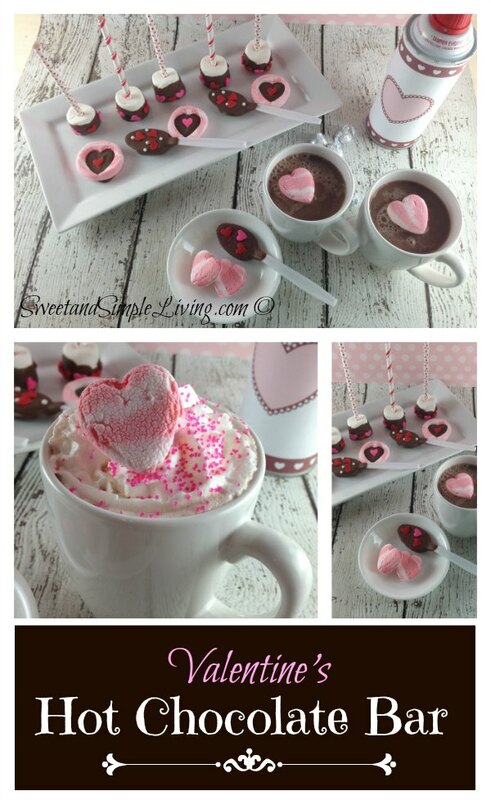 How about a Valentine’s hot chocolate bar? 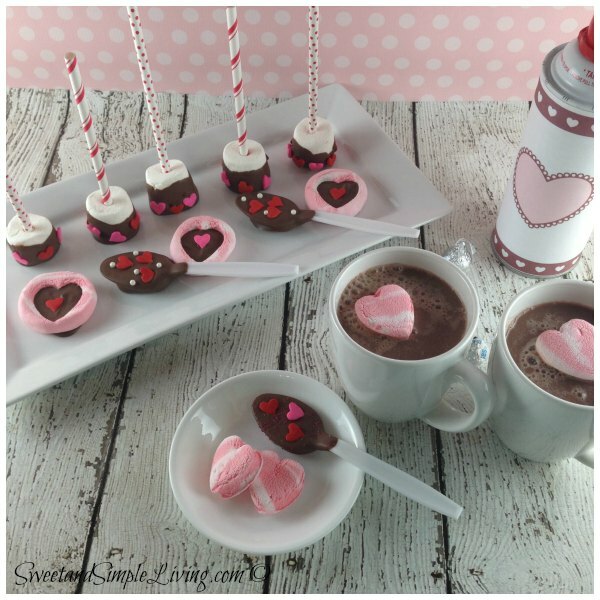 Whether you enjoy creating all the goodies yourself, purchase them premade or just lay out some Hershey kisses and marshmallows, this idea is sure to be a crowd pleaser! I think this would be a wonderful treat to have ready when the kids get home from school. After all, for most of the country, it’s pretty chilly in February. We have a whole bunch of kids in the neighborhood (we call them the scooter gang, more on this in the future) that I think I’m going to invite over after school on Valentine’s Day to share in a yummy hot chocolate bar. I can just imagine the looks on their faces! 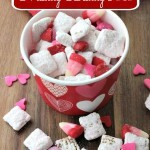 Our original idea was to create heart shaped marshmallows. 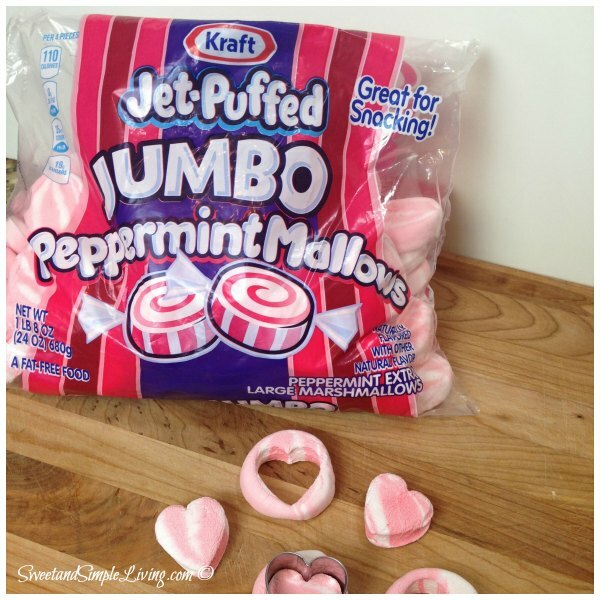 When we went to the grocery to pick up all the goodies we came across these-Kraft Jumbo Peppermint Marshmallows. These were perfect to cut hearts from because they are flat! No trying to cut regular large marshmallows in half, whoohoo! We used the heart shaped cookie cutter from this set. 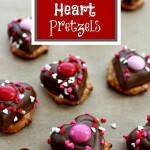 If you already have a small heart cookie cutter great! Just be sure to use a metal one. 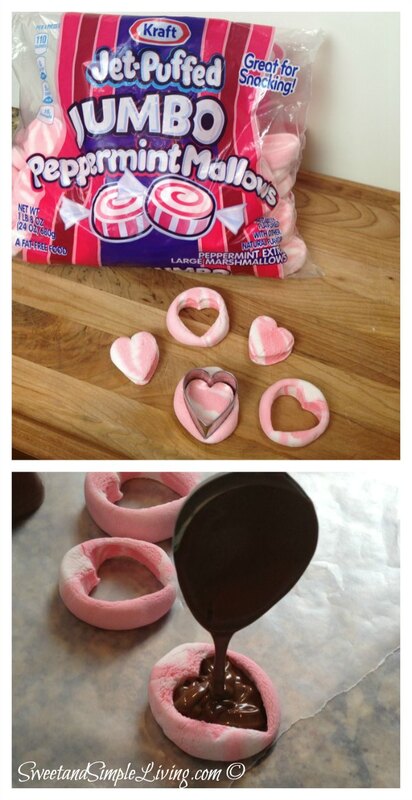 A plastic cookie cutter won’t cut through the marshmallow. Once we saw how cute the the left over marshmallow parts were we decided to try filling them with melted chocolate and it worked! To do this yourself start with chocolate almond bark, melt it in the microwave following the package directions. Be sure to melt chocolate in a glass bowl, not plastic. Lay wax paper over your work surface then just spoon the melted chocolate into the opening. To get rid of the lumps and bumps in the chocolate just squeeze the marshmallow on the sides and it will settle down nice and evenly. From there were knew we wanted to create chocolate covered marshmallows on a stick. We found adorable paper straws like these to use instead of sticks. Again, very easy to make. Begin by putting the stick or straw through the marshmallow from top to bottom. 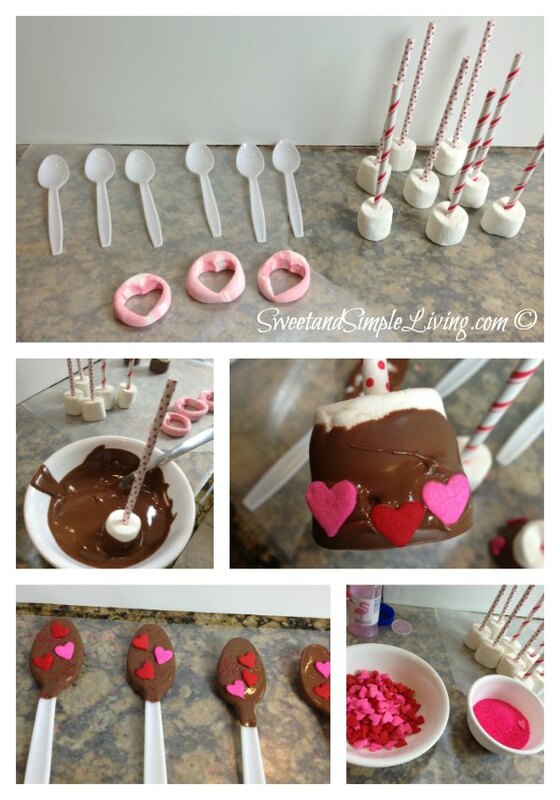 Then melt your chocolate in the microwave and either dunk the marshmallow or spoon the chocolate over the marshmallow. Set on wax paper to cool a bit. When the chocolate is almost set add your sprinkles. 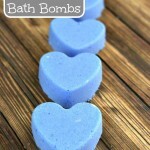 We used these large decorative heart sprinkles. You need to let the chocolate set a bit or all the sprinkles will slide to the bottom. Next we did the same thing with the spoons. 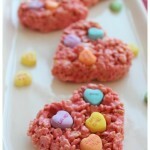 As you can see, besides the large heart sprinkles, we also used some hot pink decorative sugar. This didn’t show up very well. I’d stick with more traditional sprinkles like these, rather than the colored sugars. Last to make the look of our hot chocolate bar complete we created a printable to cover the whip cream container. I love it when everything matches! You can get the FREE printable here. Now it’s up to you as to how you put it all together. Here’s what we came up with. Want to add some delicious cookies to your spread? 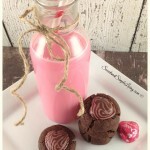 Check out the Chocolate Cookies Homemade Recipe post. 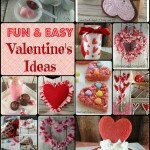 We’ve also got tons more Valentine’s Day Ideas, both crafty and edible. Check them out below. Owl Crafts: Easy Treat Bags, their little heart shaped bellies make them perfect for Valentine’s Day. 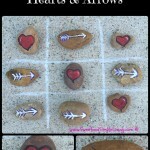 LOVE the ideas that Kathy & Sugary Flower posted!! I third the fairy tale vote! A back to scohol theme would be fun toward the end of the summer. You might do a beach or swimming theme that would go along with that common summer past time. I like the idea of some equipment based ones, and I also think a hand molded onigiri theme would be fun. A patriotic theme would be fun for the 4th of July. Transportation would be a fun, as well as animation (like an animated character). Looking forward to seeing what you come up with! !